The list of the offenses for which liberal – or even left-leaning – activists, journalists and thinkers are accused is long. Perversion. Oversensitivity. Reverse-anything. Propaganda. Hysteria. Philosophical and political differences are a game of inversion, and both sides are convinced that their view is correct and the other is a gross distortion of reality. (So, in the spirit of full-disclosure, I will say that I believe that my liberal, social politics represent a fair, just and progressive world.) 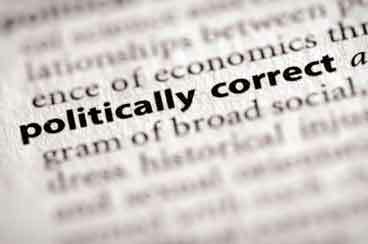 But the crime for which liberals are most often accused is political correctness, or, even handier, of being “too PC”. The charge comes with any left-leaning argument, no matter what the goal. In Canada this year, author Margaret Atwood joined the call for the lyrics of the national anthem to be changed. ‘In all thy sons command,’ she argued, ignored 50% of the population. In the interest of gender neutrality, wouldn’t the anthem be more representative if the lyrics were changed to a variation of the original version, ‘thou dost in us command’? The suggestion was received with an eye-roll by many and outright scorn by some. Why meddle with tradition? Who’s being hurt? The debate died down pretty quickly and the anthem remains as it was. In April, Sweden introduced its official gender-neutral pronoun, “hen”; a move toward trans-inclusiveness that went unnoticed by the rest of world until it was already in the country’s National Encyclopedia. (Reported Slate, journalists, writers, bloggers and linguists had been debating the movement for some time.) While some have applauded the move, there are those who believe erasing gender from language is a step too far. The term is employed freely and broadly, not only by conservatives but also by left- leaning people suddenly faced with challenges to their own privilege. (There are few things one can count on around the holidays like the grumbles over “Happy Holidays”, even among progressives.) It’s now been co-opted by those who have never needed any protection from oppression. Whenever that status quo is challenged, those responsible are accused of political correctness – a thinly veiled scolding for meddling with The Way Things Are. And then it’s downhill from there. Because to be told you are being too “PC” is to say your concerns don’t matter, which rarely goes over well. There is little room for conversation or debate and it is difficult to convince someone that the way things are is unacceptable – not when they unknowingly benefit from the system. It’s easy to explain to someone that cross burning is racist; it’s a lot harder to explain that asking someone where they’re “really” from is a microaggression, or that “crazy” and “mad’ are adjectives that further stigmatise mental illness. The added genius of the anti-PC brigade is that it creates paranoia in those intimidated by the prospect of speaking up. It can be difficult (especially online) to talk about how innocuous aspects of life contribute to discrimination. It’s made more difficult when enough people try to convince you that you are seeing bigotry where none exists. Doubt is a good weapon against dissent. So, conversations about any kind of discrimination are fruitful only among those who are willing to listen and think critically – and with empathy – about the society in which they live. Even if no one comes to an agreement, at the very least there is a welcoming ear. It’s why, though I’m wary of people who complain about political correctness, I’m not worried that activists are being silenced by defensiveness. After all, there are many things today we consider unquestionably offensive that, at one point, were Just The Way Things Were. “…the put upon conventional thinkers..” – what does this mean? This entry was posted in Featured, Opinion and tagged Opinion. Bookmark the permalink.